Dominic Solanke today opened the scoring for Liverpool against Crystal Palace in the Premier League Trophy with a very well taken goal from outside the area. Divock Origi flicked him the ball and with one touch, the Under-20 World Cup winner controlled, span and then found the bottom corner – without looking at the goal once. It was a real striker’s effort, reminding us of Harry Kane or Jermaine Defoe. 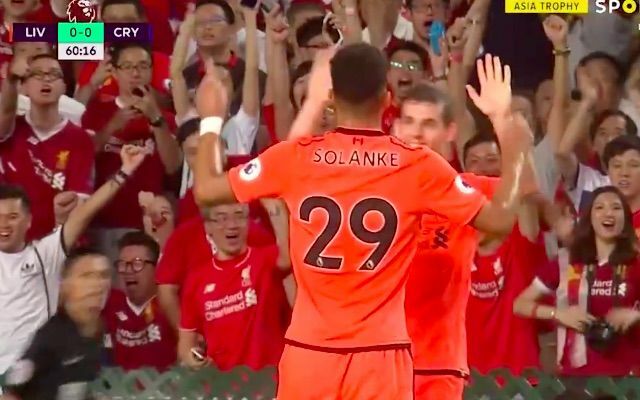 Solanke has impressed in training since arriving from Chelsea and if he keeps on performing like this, he may be closer to the first-team than we predicted.